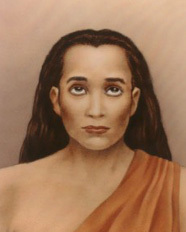 Mahavatar Babaji Maharaj is an ageless saint, a great incarnation, an immortal master, who has been engaged in the divine lila (play) of helping sincere seekers on the path of spirituality. His disciples address him by various names, such as Mahamuni, Tryambaka Baba, Shiva Baba, and Badua Baba(the ancient Baba). Babaji Maharaj cannot be described with any historical or scriptural certainty. His works are divine, shrouded in a mystery that eludes precise detail. Time has failed to reveal the facts about his birth, identity, and life. Paramhansa Yogananda’s Autobiography of a Yogi first introduced the world to this mysterious master. Still alive and residing in the Himalayas for centuries or even thousands of years, Babaji has been a guide for great spiritual teachers to carry out their special dispensations. For this reason he is called a mahavatar, a great incarnation of God. Nothing is known about his birth, his spiritual training or his abode. His miraculous appearance and disappearance and his unique way of teaching were narrated by many spiritual personalities, such as Lahiri Mahasaya, Swami Pranavananda, Swami Shriyukteshwar, Hamsa Swami Kevalananda, Paramahamsa Yogananda, and Paramahamsa Hariharananda. The deathless master emanates spiritual vibrations for the salvation of all sincere seekers. Babaji is perhaps the embodiment of spirit of yog sadhana, a guardian angel to the Yoga aspirants guiding them in the path of salvation.